We know these signs do not protect law abiding people, but are they even legal? If there is a no gun sign on the door of a business I will just go through a side door where they don't have the sign or I will just say I didn't see the sign. Then I can't be held liable. Is it true? Do you avoid any potential criminal or civil liability if you don't see or don't notice the sign? Before we proceed I want to clarify that the subject of this article is private property. Ignoring restrictions on government buildings, city, county, state, or federal, carries heavy and clear legal consequences. That is outside the scope of this discussion where we are focused on the potential liability of ignoring restrictions enforced by PRIVATE PROPERTY OWNERS. 2: If the state specifies requirements for how the business is required to communicate they restrict guns. In some states signs must have specific language, be placed at specific places, or be printed at a certain size. In some states any form of notice verbal, written, or otherwise must be sufficient to carry the force of law. So what is my point? Well if there is no real criminal consequence to having a firearm in a business that posts a no-gun sign, then does it really matter if you claim to have not seen the sign or not? WARNING: I find far too many gun owners who read a few statutes and inherently feel that they know if no gun signs do or don't carry the force of law. It isn't always that simple and even many attorneys and organizations that specifically study the issues end up without a good answer to this question for a given state. This is often due to the lack of precedents from past court cases that would allow us in hindsight to see how the laws have been applied in these situations. When it comes to criminal prosecution or civil liability the reasonable standard is applied and is relevant in this circumstance. What I mean is that while ignorance of the law is no excuse, the gun owner needs to be put on notice in a way that effectively communicates to a reasonable person that firearms aren't welcome in that business or on that property. To clarify further, is it reasonable for a gun owner to assume that every business prohibits guns? No, it is not. The vast majority of businesses and establishments do NOT prohibit the possession or carrying of a firearm so it is generally reasonable for a gun owner to assume that any business they enter does not prohibit a firearm. Thus there is a relatively high standard placed on the property owner who wants to prohibit guns. They must go to some effort to communicate to any person entering the premise that they have a policy in place that prohibits guns. That effort must be considered reasonable, meaning that a normal person under normal circumstances (based on the judgment of the arresting officer, prosecutor, judge, or jury) would have clearly understood that firearms are not allowed on the premise. So if the sign is only placed on one of 4 different entrances to the building or is so small nobody can read it, or is placed somewhere normal frequenters of the business do not go, or is too vague about what is being prohibited or communicated at all then the property owner likely hasn't gone to the reasonable effort required to be able to prohibit firearms. Now, there are other reasonable ways a prohibition could be communicated other than a sign. Perhaps on your first day at your current job your employer handed you a printed out binder or book called an employee manual and asked you to read and review it and then had you sign a document stating you would, in fact, read it and would be held legally accountable to all the company policies listed in that manual. I would say that is fairly reasonable although perhaps one could argue that nobody ever reads such thing and it would be more reasonable to assume that new employees don't read it. Perhaps you have been verbally notified by a business. I would say that is fairly reasonable as well. So Can I Pull the Ignorance Card? First, that the property owner failed to reasonably put you on notice. That acting as a normal person in normal circumstances you were not adequately informed of the policy or that due to extraordinary circumstances you were not adequately informed. Second, that due to the property owner's failure to put you on notice you were in fact fully unaware of any prohibition or policy that you might have been breaking. Fail to prove either of those two points and I think your claim of ignorance is not helpful or valid. *Disclaimer: I am not an attorney. I cannot provide legal advice. When you have questions about laws I encourage you to retain local competent advice from an attorney. If sign is posted, don’t disrespect by going in side door where there is no sign. Just don’t patronize that business and let your friends know not to buy from there. You want respect, you have to respect them. Just go somewhere else, simple, safe and the right thing to do, disclosure: in my opinion. would this apply to retired LE w CCW? Absolutely, it should. A retired LE should have no rights not given to the general populace. They are retired, ie, not in law enforcement any longer. They are now “civilians”, the people they disrespected for their entire LE career. Welcome to the masses. The Law Enforcement Officers Safety Act (LEOSA) is a United States federal law, enacted in 2004, that allows two classes of persons—the “qualified law enforcement officer” and the “qualified retired or separated law enforcement officer”—to carry a concealed firearm in any jurisdiction in the United States, regardless of state or local laws, with certain exceptions. As long as you maintain your quals with your agency, and are in good standing medically… you are good to go. Sad your experience of LEO is so negative. I’ve only met fantastic people serving in a very tough job! If your state, or department, issues a retired LE ID AND states that retired LE can carry a firearm then you CAN be seen as a fully authorized on-duty LE and the restriction does not apply; however, if your state, or department, does not issue that ID and does not state the retired LE can carry then you are just a private citizen with a CHL\CCW\LTC and are responsible for following the exact same laws as all other citizens with the CCW\CHL\LTC. Some departments in Texas issue a retired LE ID that states that they (the retired LE) are seen as a fully authorized on-duty LE while other departments in Texas do not issue that same ID – it is a “catch 22” situation. Check with your former department and state attorney general. Depends on the state. I believe in the DPRC (Democratic Peoples Republic of California), where I live. If they catch you and ask you to leave and you do, no problem. If you refuse to leave, then your are trespassing and could be cited and or arrested. From someone that is retired LE, Yes it applies. It takes time to leave (in my case 34 years of service) behind. Retired LE are now part of the citizens we used to serve. This question has not been addressed! What if I as a criminal am intent on robbing you and your customer of your cash and valuables and I enter your store or place of business, “Am I too prohibited to carry in my weapon into your business as a tool of my trade?” And, if I do, who there will be able to stop me from conducting my form of work? Just a thought! I agree completely, they dont need my bisiness or the business of my family, friends or business associates! I have a large family! I agree 100%! If there is a sign stating “No Firearms Allowed” then I won’t step foot in that business. I will certainly tell all my gun-carrying family & friends to do the same. If that’s the way the store owner feels he will only be hurting his own business in the long run! I agree 💯. This is my policy. This is why I no longer shop at Target and Panera Bread.. I think if a business doesn’t want me to have my firearm then they don’t need my or my friends dollars. Like in the case of starbucks my firearm isnt welcome therefore they don’t need my money. That’s just my opinon. Think about buying coffee from the Black Riffle Company instead of Starbucks! Really GREAT coffee, downside is you will have to make it yourself. I have had multiple (disturbing) debates on the “Texas 3006” app that tracks legal “no gun” signs on private property in Texas. I fully agree with your take Jacob; the communication must be reasonable, but the app I referenced interprets the Texas law to the exact letter. For example, TX law requires specific signs be posted in both English and Spanish at all entry points. If a company has the EXACT correct sign (language, size, color) but is only in English, NOT also in Spanish, they consider the entire establishment “invalid”. As a former LEO (Retired), a former Judge (retired) and a current teacher of LTC I can tell you if the signs do not comply with the law, and the proprietor tells you to take the gun outside, or no guns allowed, or whatever, at that point you are not liable. However, if you stand and argue about the sign, the second amendment or who has the biggest arm you are then liable as a trespasser. Leave it outside if you want to go in, or go down the street to the place that wants your business. Don’t push. Bad cops make bad laws. The same can be said for pushy civilians. IF you are noticed carrying on PRIVATE property, whether they have a sign posted or not, the property owner, or representative of, must inform the person that they don’t allow firearms and that they must leave and can only reenter if they are disarmed or that they are not welcome back at all. It doesn’t matter by state except that states’ respective TRESPASS laws. The only time this will ever be an issue is when the firearm owner refuses to comply and then the local law enforcement will enforce the trespass laws. However if you comply with their request to leave, there aren’t any repercussions that i am aware of. I’m no lawyer either but this has always been my understanding. In other words, if you properly carry concealed, they’ll never notice, and if thay don’t actually tell you to leave, you haven’t broken the law, and if they do notice and tell you to leave, all you have to do is leave. Mike, I’m afraid that is an over generalization. There are states that have laws that support the private property owner’s decision to prohibit firearms and thus to break that policy is to break the law. Texas is an example. New Mexico & Illinois are two more that I know of. All 3 of those states have specific statutes that prohibit the gun owner from breaking a prohibition in place by a private property owner. However, Jacob, the private property owner MUST give notice that they do not want firearms on their premises. If they do not give some kind of notice (at the entrance with a sign that is clearly legible, or to the carrier of the firearm verbally or in writing) then the statute does not apply because no notice was given. Until notice is given (by signage, verbally, given in writing to the firearm carrier by the private property owner, PUBLISHED state law, or PUBLISHED city ordinance) then there is no statute or law that you can be charged with violating. In Michigan the private property laws are for actual “private property” like a dwelling or other property not open to the public as a place of business. To the best of My understanding, if you have a business that is open to the public all citizens are assumed welcome and have to abide by State and Federal law on the the legal concealed carry permits and are not considered “private property” during business hours. Putting up a sign that says no Firearms allowed are a suggestion but not enforceable by law if it is a business. However, any business that would put up a sign like that should be treated by American Citizens like a business that would put up a sign that says “No Black’s, Mexican’s, or Jew’s Allowed”. In Texas if they have a 30.06 or 30.07 sign posted, that is your notice. If you carry past it you are already trespassing. They can simply call the police without ever speaking to you. They DO NOT have to also give you a verbal request. In MO, my instructor told us the sign legally didn’t matter unless you were asked to leave as stated above. For example I was going to the zoo. They have a no gun sticker on the front doors. I asked a police officer if it was a federal or state building letting him know I intended to carry. He said I would not be in any legal trouble if I was caught with a weapon on premise and that they can only ask me to leave. My suggestion is ask a cop and take their name and badge # to reference just in case. As a Sergeant in LA for 34 years, ignoring a no gun sign to someone in lawful possession of a firearm, is nothing. The owner can ask the person to leave and failure to leave can lead to an arrest for trespassing. There is no law broken regarding the gun. Besides, if the weapon is concealed, who is going to know? In my state those little signs don’t mean squat. The most they can do is ask you to leave but if you are carrying concealed properly they won’t even know. Josh, I think I know answers but I’m going to do some digging on this and get back to you. Not sure about all membership coverage, but CCWSafe is (You are not covered if use a gun where it is prohibited). IF WE COULD ONLY HAVE ONE LAW for the WHOLE DANG COUNTRY on gun laws and about every other law it would be great. Too many dumb stupid states anyway. I’ve spoken with CCW Safe, USCCA, and US Law Shield. All said the same thing. If the incident takes place somewhere where you could not LEGALLY have the firearm then the incident isn’t covered. Essentially all 3 have a provision that if you are actively breaking the law then you aren’t covered while you are breaking the law. So, depending on the state and if no gun signs have force of law or not your coverage may or may not apply. Thanks for putting this out there Jacob. It actually happened to me yesterday. The family and I went to an establishment that we have gone to for years and that I have carried (concealed) at many of those times. This time though, there were signs posted in the bottom left corner of the entrance window. I never saw it, but my son did. He stopped me after we entered and showed it to me. He asked if I saw it and if I was carrying. The family is just used to me doing so. As we ventured back toward the door, an employee stepped forward to say something. My son spoke up and said don’t worry, he’s taking it back to the car. My wife stayed in the establishment. When we returned, the employee made note of us but also acknowledged us kindly. Against my better judgment – it was probably best that I did return it to the car. To have played ignorant would have only caused us trouble. “Sneaky” in how we are notified. I also need to be more aware of what the business is asking. Like us, they have their reasons for us not to enter armed, as we have our reasons to be armed. Pleading ignorance is only good if you truly are. What you did was right on. But after finishing your meal you should have contacted the manager and informed them that you have been a long time customer but would never be returning as long as they have the new policy in effect. Nuff said. I must say that all the back and forth between josh and his contact were really informative. I will say that I went to a store that I had been in many times and one day there was the sign so I left my gun in my vehicle. Upon returning to the store I found the manager and asked him about the sign. He said that was correct. I left and did not return for a while. When i came back I asked if he was going to garrantee my safety the whole time I was in the store. Also he would not garrantee my safety to and from my car. Soon after the sign was removed the sign. NO FIREARMS ALLOWED – THIS IS A GUN FREE ZONE. The reactions are usually priceless. I do not patronize businesses with such ignorant and dangerous policies and let the management know why. Just the fact that it is a gun free zone makes it a more dangerous place, at least theoretically. I am taking it a step further. I am compiling and will later publish both the establishments that welcome law abiding citizens to carry as well as the dangerous gun free zones. Perhaps even linking the gun free zone business to more reasonable competitors nearby. We are not an insignificant minority easily bullied into letting our rights atrophy. Vote with your $$ and tell a friend. The additional monetary cost to holding such a dangerous policy will likely be enough to reverse many though not the zealots. There is nothing to debate – if a private property owner says “no guns allowed,” then that’s it – end of story – and no law can interfere with the right of a private property owner to decide whether or not they want people to carry on their property. Property owners ALWAYS have the right to say what is and is not allowed on their property – and that goes not only for carrying guns, but for anything else, whether it’s no drugs or alcohol, no hats, no yellow shirts with purple polka dots – it doesn’t matter – property owners have the absolute right to say what is – and is not – allowed on their property, regardless of what the law allows. When it comes to our right to carry, just because you can doesn’t always mean that you should if others object, especially with respect to private property owners, as in this case. Don’t get me wrong – I’m very pro 2nd Amendment, but I also believe strongly in respecting the rights of private property owners to set whatever rules they choose to regarding this issue, which is why I only carry in my car and therefore avoid this problem altogether. As a follow-up: if an establishment posts a No Guns policy, and a customer is wounded or killed by someone who ignored the signs, for whatever reason, will the wounded customer, or his survivors, likely be successful in a civil lawsuit against the establishment that denied him/her the option to defend him/herself, or a family member? Just curious if anyone has any knowledge of this occurring anywhere. What’s the issue ? Just conceal carry. Problem solved. Go somewhere else, plenty of businesses would like your money and protection while eating and shopping and you don’t have to be a VICTIM because of stupid laws. They didn’t give me a legal cc because i’am a criminal. The more people do that , the word spreads. The real issue is …under what circumstances will it be known to the proprietor that you are carrying? Assuming the weapon is “concealed”, it is unlikely that you would be noticed. Now, assume circumstances (as you interpret them) call for you to pull out and present your weapon. Here is where it gets tricky. A) you use your weapon in an acceptable (to the law) way and b) you prevent a robbery/stick-up/crime. The fact you were in violation of the establishments policy concerning carrying concealed weapons is unlikely to become an issue. On the other hand, should you improperly (in the eyes of the law) reveal you are carrying, that is when the problems arise. Just saying. Carrying concealed in an establishment that prohibits such does not obligate me to use that weapon to defend the establishment, its employees, or other patrons in the event of a violent act or threat by some other person. Depending on the establishment and circumstances, it may be most prudent to not present your weapon except to protect yourself, your family, or others in your group from violent acts or threats directed specifically at them. There is no reason for me to become personally entangled in such a situation when the establishment has specifically requested, via their “No Firearms Allowed” policy, that I do not intervene.. Assuming a no-force-of-law state: How immediate is my need to enter? Am I sprinting thru the emergency room doors with an unconscious child in my arms or am I visiting a patient at the hospital? Other establishments are likely to get a nice “no guns, no money” letter explaining how their no-guns policy has enriched their competitor, maybe even with a sales receipt enclosed. I saw a no-guns sign posted “firmly”, as confirmed by phone with management, at (of ALL places) an auto dealership. In a state where more than ten percent of residents have permits, the sign didn’t stay up long. . I have always been armed, wearing concealed, working in 8 states; all of which were the staunch ANTI-GUN STATES, the decision reached being simply; Being always prepared to protect myself and my wife and children and never, never, never leaving their or my safety to other than ME. For 60+ years I have always been armed and that is true to this day; I now 81 and still always armed. My thought is you are a CCW holder, carry it and don’t worry about it. Concealed Cary means nobody knows. Not sure how it gets to, oh he has a gun, get out of here. Secondly don’t ever spend money at a place that has those signs to begin with. Let the business know on Yelp! why they lost your patronage. ok so if i can’t carry my fire arm in places that have a no fire arm sign if something happens to me in that store shouldn’t the owner be held responsible for anything that happens to me or my family. if i am hurt of a member of my family is hurt shouldn’t they be held libel for all medical bills ect. possibly sued or held for manslaughter charges, if someone dies they are denying me the right to protect myself. yes i know there are some places that you can not carry government buildings oct.
What if i leave my firearm in my car and i go inside the business, a few minutes later a guys enters the business for a robbery or an attack. Would i be able to defend myself and those people who are in danger? No because the business owner desired to put a sign not bring my firearm inside. … as a licensed bail bondsman and Private Investigator, I have 3 different licenses to carry… one each for BB, PI and as a private citizen. Two issued by my state, one issued by my resident county. So… does that restriction placed by the business owner apply to IE. professionals in LE connected associations or just to private non-relayed CCW’s. I cannot imagine the business owner would want to restrict LE from entering their business. … of course, BB and PI are quite different from full blown LE. So, that may be a difference that is applicable in this discussion. Here’s a tragic example of how the idiocy of little “no gun signs” on private property being haphazardly applied comes home to roost. The Cascade Mall in Burlington, Washington had a shooting several years ago, when a young man walked into the Macy’s there and gunned down customers with a rifle. We lived a few miles away then, and my wife frequented that store– fortunately she wasn’t there that evening. But that mall had signs on the mall doors, but not the store doors opening to the outside. Any business that puts up such a sign may as well put up another sign that states this business is not under any protection and you may feel free to enter and kill anyone in this building. I think each of us need to make the conscience decision, as to why we chose to carry in the first place. I carry just like you do, to protect and defend. And so each of us, will bear the consequences if we are violating someones policy. I am impressed when I enter a public library, or a center for the arts and it is clearly posted “open carry not permitted”. What a great way to welcome ccw citizens. Like most of us, I consider right away where I am I going today, and can I carry? Having a gun safe in the car helps, if in fact you disarm to walk into a sports arena, or the airport. Some of us may not agree, but if I see any notice of “no firearms” on an entry window of a building, and there is no state revised statues code at the bottom of that sign, then I carry. The only exception is a state, city, federal building; then of course I won’t even bring it in. There are enough armed officers in these places, to protect in the event. Plus, I don’t want to set off the alarm, and cause any officer panic. We love our LEO. A question I have on the topic is, does the “no firearms” rule also follow for law enforcement? I live in MS & here if any law officer comes on my property, (excluding Federal Marshalls & Game Wardens) if they don’t have probable cause, warrant or court order, I can legally request them to leave my property. I believe if this is true for the firearms also, some business owners would drop their rule because this would also exclude law enforcement, at least depending on state or local laws. I’m curious if there are past or present civil liability suits against businesses by victims of gun violence committed by criminal elements after the victim(s) was barred from carrying his/her protection. If so, does the business own it’s responsibility for safety of its customers when barring their ability to protect themselves and their families? Kansas law requires a no gun sign to be posted at a certain height by every access door to a building. It specifies in writing that if you are asked to leave the building when in possession of a firearm and refuse to do so you can be charged. A guard at a major hospital; said if they found a gun they would take possession of it until the person leaves the building they would return it. This hospital is posted. 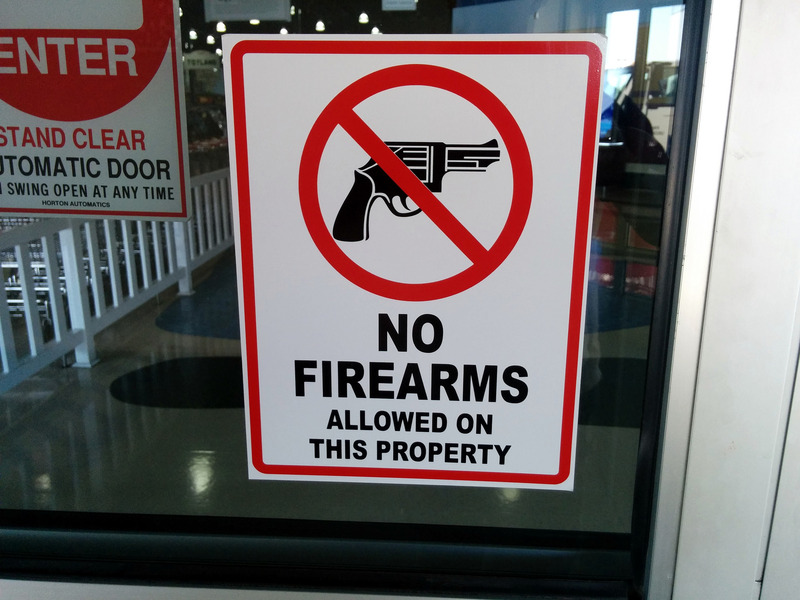 The signs usually say that a business does not “allow” guns. They do not say guns are “prohibited”. There is a difference. It means to me that my concealed carry is not allowed by the owner of the business. So if No one knows I have it, what difference does it make that I am carrying? I don’t have to say I didn’t see a sign because the issue never comes up. Regal Cimema in Niles, Ohio has no sign on the door. I accidentally noticed, while looking around while my wife bought tickets, a very small sign on a wall inside saying guns were prohibited. I think they want it both ways. They do not make proper notice, can say they are not liable if a shooting takes place, but do not mind if there is a gun inside if a shooting happens. Or, maybe they are just careless and I am reading roo much into it.